How to use the Coastal SAF Website? The website contains a 5-step-manual for a full SAF application. The manual is designed and structured in such a way that you can intuitively choose the depth of information that you need to implement the individual steps. By sliding over the above navigation menu, you will be able to choose your starting point. We recommend to start with the introduction for each step in order to move on to the manual. The manual is set up as a task list for each of the steps. Each step has three to four main tasks and a series of subtasks and activities which you will be able to discover by mouse click. Surely you will need some additional information to implement the individual tasks. Therefore, the manual offers you instructions on how to carry out the tasks. Clicking on these instructions will lead you to a page with more comprehensive text, also offering you to move up and down on the page, as you are seeking for information. These instructions will open in a new tab in your browser, so that you will always be able to move back to the main task list. If no new tab opens, please check your browser settings or refresh the page. Once you are reading the instructions on how to carry out a certain subtask, you will find a list of contents called ‘Task List’ on the upper right side of your screen. This list lets you move within these instructions intuitively. By clicking on one of the subtasks you will directly be moved to the respective paragraph. In the beginning of each paragraph, you will find a little TOP button. This button leads you back up to the top of this page and to the Task list. Note that you are still in a separate tab! If you would like to go back to the main manual, you will have to either close your present tab or switch tab. This allows you to freely move between the different levels of depth and always be able to go back to the primary level of the manual. As you see in the above image, you will also find examples for the various tasks. These examples are taken from the 18 study sites of the reference project SPICOSA, where the SAF has been tested. Beware that these examples are not considered best practice but are to give you helpful support for your implementation. Where possible, constructive comments have been added for an enhanced understanding. The examples will open in a new tab in your browser, so that you will always be able to move back to the respective task or text. Once you clicked on a link in the manual, the link’s color will fade from red to grey. To undo this, you will need to clear the cache of your browser in your browser settings. The Systems Approach Framework is based on the challenge of bringing together general and soft systems methodology and a variety of social-ecological concepts and approaches, such as those of von Bertalanffy, Odum, Checkland, Holling, Luhmann, Habermas, Constanza, Ostrom, Daly and Ruston – to only name a few. For each step you will therefore find a valuable set of additional readings, such as papers and informative reports on social and economic tools, scientific articles and publications, as well as a list of key references, on which the respective step draws. There are a number of core-terms and words, that we use, and want you to understand – some with a particular technical meaning. When they first appear in the text, these words are highlighted as links with a second dotted underline. Hovering your mouse over this word will give you a definition of it, and clicking in it will take you to that word in the SAF’s glossary. Throughout the reference project of SPICOSA, a set of support-sites, such as a model library, several databases and training modules have been built and video-lectures have been produced. Explanation and links to these sites are found within the manual and in the additional resources . The respective sites will open in a new tab. If this does not happen, you might need to change your browser settings. The site uses a default font size. If you would like to change the font size of the texts manually, you can do so by clicking on the font size symbol on the upper right. Common key sequences, such as ctrl+ or ctrl and mouse scroll will of course also do the job of zooming in and out. All images, diagrams or other illustrations are set to a default size. By clicking on them, an enlarged version will appear on a new tab. You want to find a word, concept or text that you read earlier or are curious if a certain term, location or author is mentioned on the site? Use the search bar for an easy search on the site. 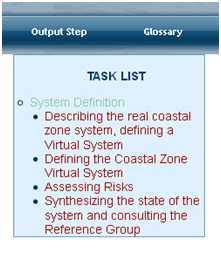 By entering your word, the machine will do a search within the costal-saf.eu website and display the results. You should now be well-equipped for your SAF application! The site has been tested for its functionality in Mozilla Firefox, Google Chrome, Internet Explorer 8 and Safari.